Proof Silver Libertad coins from the Mexican Mint are distinctly different from their bullion counterparts in terms of visuals and availability. Proof coinage delivers a beautiful, frosted finish to design features and a mirrored background. Additionally, the low mintage figures ensure limited availability. 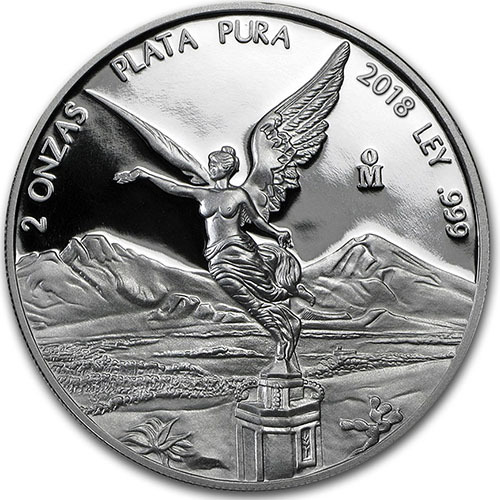 Right now, 2018 2 oz Proof Silver Mexican Libertad Coins are available to purchase online at Silver.com. Ships to you housed in a protective capsule! 22nd release year of 2 oz Proof Silver Libertads! The obverse face of the coins features the coat of arms and 10 historic versions. Winged Victory and the twin volcanic peaks of Iztaccihuatl and Popocatepetl are found on the reverse. Each of the 2018 2 oz Proof Silver Mexican Libertad Coins in this listing is available to you inside of a protective capsule. The Mexican Mint has a strict, reported mintage of just 5,000 silver coins in this weight for 2018, so these products won’t last long! Proof Silver Libertad coinage debuted in 1983 with a 1 oz silver coin and continued forward from 1986 with annually releases. In the 1990s, the Mexican Mint expanded the series twice. The first expansion occurred in 1992 when a ½ oz, ¼ oz, 1/10 oz, and 1/20 oz coin were introduced into the collection. The second expansion occurred when these 2 oz silver coins and a 5 oz coin were introduced. On the reverse of 2018 2 oz Proof Silver Mexican Libertad Coins is the image of Winged Victory. She is accompanied on this side of the coin by the twin volcanic peaks of Popocatepetl and Iztaccihuatl in the background field, along with engravings of the coin’s weight, metal content, purity, year of issue, and a mint mark. The obverse side of 2018 Proof Silver Mexican Libertad Coins features the modern coat of arms in the center. This image depicts an eagle battling a snake on a cactus branch. Below the seal is a laurel wreath and above it the words “Estados Unidos Mexicanos.” Around the outer edge of the design are 10 historical versions of this same symbol. Proof Silver Libertad coinage typically has a more stable mintage than its bullion counterparts. For most of the 2010s, the Proof Silver Libertads have seen mintage figures remain between 1,000 and 5,000 annually in the 2 oz weight. 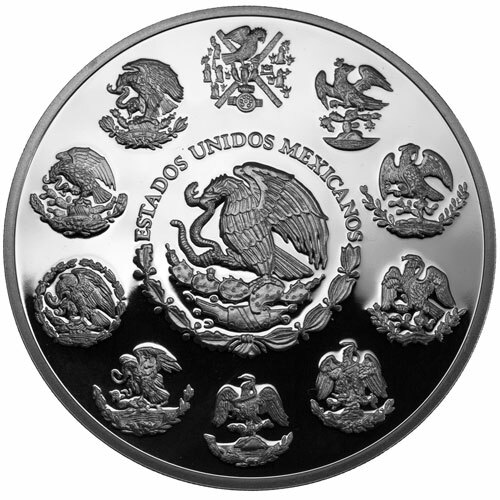 The Mexican Mint is the official sovereign mint of Mexico. Controlled by the federal government and Banco de Mexico, the Mexican Mint’s history dates back to 1535 when Spanish conquistadors formed the first Mexican Mint to refine silver and gold for transport back to Europe. If you have any questions, please don’t hesitate to ask. You can reach Silver.com customer service at 888-989-7223, chat with us live online, or send us an email.